Sub-Saharan Africa’s economic development is still constrained by a historic dearth of infrastructure investment. Private sector investors might be able to provide the hitherto missing link. Controversial development: Dams such as the Kariba on the Zambezi river provide vital electricity but also cause local disruption and hardship. In a July 2008 report the World Bank assessed its own infrastructure engagement over the past 20 years and acknowledged it has learned an essential lesson: “There is no longer a debate about whether infrastructure has a role to play in poverty reduction; it is crucial,” the bank concluded. “Modern, cost-effective, reliable and affordable infrastructure services are critical for sustainable development,” says Katherine Sierra, the World Bank’s vice president for sustainable development. The bank is putting its money where its mouth is. Over the next four years it expects to invest between $59 billion and $72 billion in infrastructure projects—and hopes that investment will draw in an additional $109 billion to $149 billion through official development assistance from leading developed economies as well as other public and private sector investments. Valli Moosa, the chairman of South Africa’s biggest electricity company, Eskom, says, “The continent as a whole is clearly on a growth path, whatever ups and downs we may have in the short term…and that means there is a need to lay on vast amounts of additional energy capacity for the African continent as a whole.” With 900 million people, Africa accounts for almost a seventh of the world population, yet it still generates only 4% of the world’s electricity. Half of this electricity is produced and consumed by South Africa, underlining the strategic importance for the continent of what happens inside that country’s energy sector. Eskom is building one new coal-fired power station for $12 billion; this will be followed by the last coal-fired power station South Africa plans ever to build. Moosa is emphatic: “We are bringing an end to the era of coal in South Africa and switching to climate-friendlier technologies, investing about $220 billion into the power sector over the next 20 years.” Eskom will be building at least 20,000 MW of nuclear-generated power, with the first nuclear plant due to be commissioned between 2015 and 2020. Although South Africa does not have the water for hydroelectric power plants, other African countries such as Congo have tremendous hydroelectric power potential. A grand project to build a series of dams along the Congo River’s fast-flowing stretches could theoretically supply over 40,000 MW. More than a dozen other African countries, including Ethiopia, Zambia, Cameroon and Kenya, already obtain 60% or more of their electricity from hydropower, and since donors typically avoid greenhouse-gas-intensive operations, such as building coal-fired stations, leaders such as Moosa believe that African hydroelectric power generation has a big future. There can be little doubt that Africa’s infrastructure needs are huge. Paltry investment and insufficient maintenance over the years mean that the operational stock has lagged well behind population growth in recent decades. The Infrastructure Consortium for Africa, established in 2005 in the wake of Group of Eight commitments to raise aid to Africa, estimated that additional investment of $10 billion to $14 billion annually would be required to bring infrastructure up to levels compatible with the Millennium Development Goals by 2015. Nigeria alone needs infrastructure investment of $170 billion over the next six years. Graham Stock, JPMorgan Chase’s executive director for emerging markets research, believes that the main obstacle to greater private sector involvement in the provision of financing for such investment is the lack of a clear and reliable regulatory environment. Such an environment, he asserts, needs to give investors confidence in the financial parameters of a project, including both the viability of prevailing tariff structures or revenue streams as well as the ability to recoup initial capital costs by exiting an investment when desired. Stock says these challenges are magnified when, as is the case in Africa, investors are generally required to take construction risk rather than assume ownership or management of existing assets. “Once the prospective regulatory environment is settled, governments need to package projects to a high standard, so that investors are provided with enough data to assess risks properly—for example, by supplying data on existing road usage,” he adds. Where such investment is needed right now is in places like the Democratic Republic of Congo (DRC), which has vast mineral wealth but a dilapidated infrastructure framework. Only 2,800 kilometers of tarred road have been laid since the country’s independence in 1960. With such poor roads, many parts of the country are inaccessible, creating extreme bottlenecks. Colglazier points out that DRC’s GDP per capita figure, which sits at a paltry $300 per year, makes it one of the poorest countries in the world, despite its abundance of gold, diamonds, copper and zinc. Access to electric power can be the deciding factor in a country’s development. Mineral extraction is highly reliant on large supplies of electricity; with insufficient power, the wealth remains untapped. Nigeria’s current electricity supply capacity, catering to its entire 140 million population, is a mere 3,500 MW. This contrasts with South Africa’s still-insufficient 40,000 MW and is miniscule compared with the United States’ 1 million MW generation capacity. “Here, like in several other places in Africa,” says Colglazier, “we have identified several power generation projects with an obvious business case, reliable sources of cash flow and world-class management, ready and waiting for our capital.” Unfortunately, there are many other factors than capital that determine whether power plants get built. In contrast to the DRC and Nigeria, Botswana has proved it is possible to manage vast mineral wealth in a sustainable way. But Alia Yousuf, head of emerging markets at Standard Asset Management, says Botswana’s infrastructure investment success is proving the exception, not the rule. “Instead of pilfering its diamond treasure chest, the Botswana government has invested heavily—building roads, airport and telecommunications equipment and improving water supply—while at the same time remaining fiscally responsible,” he says. At independence in 1966 there were only a few kilometers of asphalted roads—all inside city boundaries. Now, all the major towns in Botswana are linked by paved highways. Mozambique, too, is keenly aware that infrastructure investment is the key to its future prosperity. The multi-billion-dollar Maputo Development Corridor initiative, which began just over 12 years ago, provides much of sub-Saharan Africa’s industry with a shorter link to the Indian Ocean. Yousuf says that the country’s government recognized that only once this connection was in place could its port realistically compete in the region. “Now that much of this development has been done, they are in a position to expand capacity in what was once formerly known as Delagoa Bay,” he says. Several thousand kilometers away in Gabon, another port expansion is enlarging as a direct consequence of the thriving oil industry. Standard Asset Management tells its clients that both Mozambique’s Port of Maputo and Gabon’s Port Gentil present attractive investment opportunities, as both are direct beneficiaries of the booming African economy. Yousuf is quick to point out, though, that not all infrastructure transactions are attractive to international investors. “Often, the cost of funding needs to be very low given the nature of the project, and the premium is insufficient for the political risk involved,” he says. That is where donor aid is required and where organizations such as the World Bank can make a decisive difference. Private sector investors see the world somewhat differently from the World Bank, as they are looking for clear, quantifiable returns on their investments. Peter Goodall, the head of natural resources investment at French banking giant Calyon, says, “Sub-Saharan Africa’s contribution to the global project finance market remains relatively modest at just under $3 billion in the first half of 2008.” That is tiny compared to a global market in excess of $125 billion for the same period. Project finance banks tend to concentrate on natural resources projects such as oil, gas and mining. This approach is based on credit risk considerations, the banks’ aim being to ensure repayment of the loans through quantifiable cash flows generated through sales of products—especially to export markets. In this respect, Africa faces larger challenges than many other areas due to its vast size and associated infrastructure needs, a relatively small population of low-income users in low-income countries and recent hikes in fuel and equipment prices that will result in additional difficulty. One of the big constraints facing the continent is the relative lack of bankable African infrastructure projects. Matsukawa makes the situation clear: “There is a huge need to assist developing-country governments in the preparation of bankable projects.” The World Bank, along with other donors, provides various technical assistance to governments with financial support such as the provision of partial risk guarantees. Until investors see more stability region-wide, they are likely to take some persuading to invest in long-term projects in sub-Saharan Africa. And until they do, the region’s economic development will continue to be constrained. US-based Emerging Capital Partners has a rich investment portfolio in Africa—and has made some smart infrastructure-related financing moves. As the group’s investments have done well, ECP has become a poster child for the upside effects of the new and private money that is helping Africa develop its infrastructure. Thomas Gibian, the group’s Africa-focused CEO, says ECP capital can facilitate significant growth opportunities “through careful company selection and the application of global best practices in private equity investing.” ECP has a deep reach into African markets, with employees living and working in six countries across the continent, which helps ECP make profitable investments. Gibian says telecom is “one of the greatest successes ECP has seen in the development of Africa’s infrastructure.” Due to factors such as government deregulation and the advent of pre-paid phone cards, the sector has increased subscriber penetration from just 2% in 2000 to over 30% in many countries. ECP made an initial investment in Starcomms, Nigeria’s largest CDMA 3G mobile operator, in 2005 and committed additional capital over the following two years for a total investment of $34.3 million. Starcomms expanded its infrastructure and grew its customer base from 100,000 subscribers to 1.5 million, and when ECP sold its share through a private placement earlier this year, it emerged with a near 200% profit. Shares were then listed on the Nigerian Stock Exchange, making Starcomms the NSE’s first listed Nigerian telecom. Africa watchers now take the position that the best strategy for accelerating Africa’s infrastructure development will involve both the private and public sectors—and that they must be working in unison. 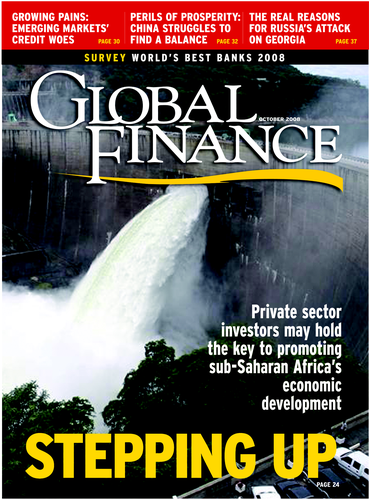 London-based Emerging Africa Infrastructure Fund is perhaps the best exemplar of this approach. EAIF was founded in 2002 by the UK’s Department for International Development, the Netherlands Ministry of Foreign Affairs, Switzerland’s State Secretariat for Economic Affairs and Sweden’s International Development Cooperation Agency. They provided equity totaling $100 million to EAIF through the PIDG Trust. Its shareholders are Standard Bank Group (as lead sponsor) and FMO of the Netherlands and US-based Emerging Markets Partnership (as joint venture partners). The aim of the fund is to provide foreign-currency loans on commercial terms for private or soon-to-be-privatized infrastructure projects in sub-Saharan Africa. By March 2008 EAIF had invested more than $331 million into 12 projects, including a power plant in Cameroon, a port in Ghana, the laying of a fiber optic cable along the east coast of Africa and construction of a cement plant in Nigeria. Debt available from EAIF for any single transaction is limited to a minimum of $10 million (although lesser amounts are considered for “highly developmental projects”) and a maximum of $36 million. EAIF provides senior debt and subordinated or mezzanine financing—but not pure equity. The maximum tenor is 15 years, with appropriate grace periods.